Now you don’t have to wait for breakfast to chow down on deep-fried donut goodness. 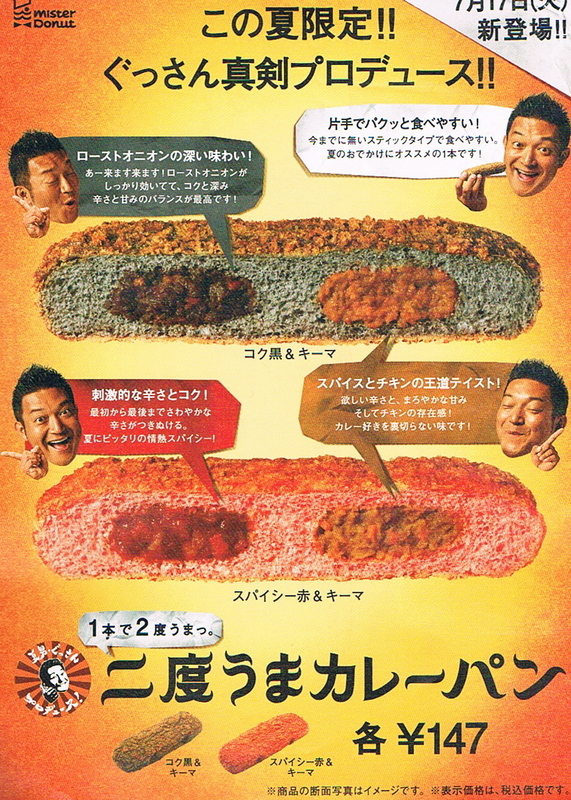 Thanks to the product development geniuses at Mister Donut, now you can have them for dinner! In fact, you can serve them two nights in a row without guilt, since they come in two colors! Although the black sesame variety looks more like something one might have been fed on the Mayflower after six months at sea, it tastes better than it weird gray color would lead you to believe. It’s stuffed with chicken curry in one end and “roast onion” in the other. The virulently pink ones segue from chicken curry to a suddenly-spicy kim chee-like filling. And don’t forget – no all-donut meal is complete without Magical Protective Donuts for dessert! I would try it just to say that I did but I would have to hype myself up first.